Your imagination is the limit to the number of applications for split tunneling. Well, that and your hardware. 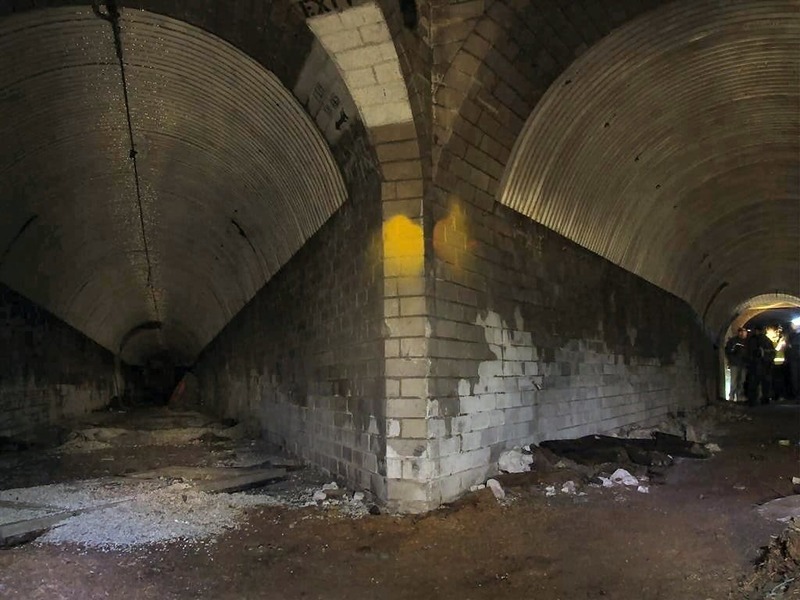 Different types of split tunneling have different technical requirements. What you can achieve depends heavily on your device, wifi router, and VPN service. Before you get started, it’s important to realize that split tunneling requires some advanced technical knowledge and haphazard implementation can lead to security risks. If you don’t properly configure your split-tunneling settings, your ISP or a third party could access some of your sensitive data. For typical VPN users, there are four main types of split tunneling. The first type is the most simple and is useful if you need to access remote resources through a VPN while also maintaining a normal, non-VPN connection to the internet. We’ll explain how to do this in the tutorials below. The third type of split tunneling is by application. You can set up a blacklist or whitelist of apps and services that you want to connect to the VPN or don’t want to connect to the VPN, respectively. The latter is sometimes called “inverse” split tunneling. For example, if you only want torrent traffic to go through the VPN, but all your other applications such as games and web browsers to connect to the internet without a VPN, this is the method you want to use. Split tunneling by application only works on some VPNs, operating systems, and router firmware. The final type of split tunneling allows you to route traffic based on its destination rather than its source. For example, if you wanted to route all traffic through the VPN except for that traveling to Netflix or Hulu. This is called IP-based routing, and it’s the most difficult type of split tunneling to accomplish. It requires a stateful router or firewall and, even if you have that, sites like Netflix have so many IP addresses that it’s hard to get it working reliably. As such, we won’t be covering IP routing in this article. Not all operating systems support all types of split tunneling. In fact, Windows users will find that their options are severely limited. Macs aren’t bad, but routers with DD-WRT or Tomato firmware offer the most versatility. Unfortunately, they are also the most complicated to configure. First, check with your VPN provider to see if their app includes built-in split tunneling functionality. While not too common, some providers like ExpressVPN do offer application-based split tunneling. 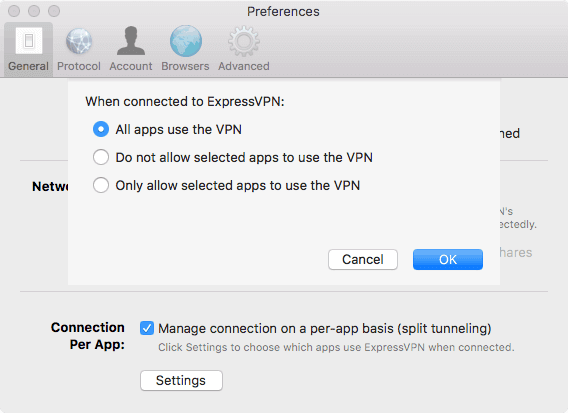 With the Connection per App feature on ExpressVPN’s Mac app, you can create a blacklist or whitelist of apps to route through the VPN. If your VPN app doesn’t have built-in support for split tunneling, we’ll have to get our hands dirty and do things the manual way. You’ll need superuser administrative privileges and an existing L2TP or PPTP connection, as well as the destination subnet for the VPN private space. Log in as root. An easy way to do this is to type sudo su into the terminal and authenticate with your Mac password. See also: Our list of recommended Mac VPN providers. Windows is fairly limited when it comes to split tunneling. There’s no way that we’re aware of to split tunnel by app or destination. Instead, the split tunneling option in Windows is much broader. You can choose not to tunnel IPv4 and IPv6 traffic so that only local traffic goes through the VPN. That’s useful if only need to use the VPN to access remote resources not available from your normal internet connection, but not much else. Furthermore, Windows only split tunnels VPN protocols that it has built-in support for. That means you’ll need to configure an L2TP, SSTP, or PPTP connection first. OpenVPN won’t work here. 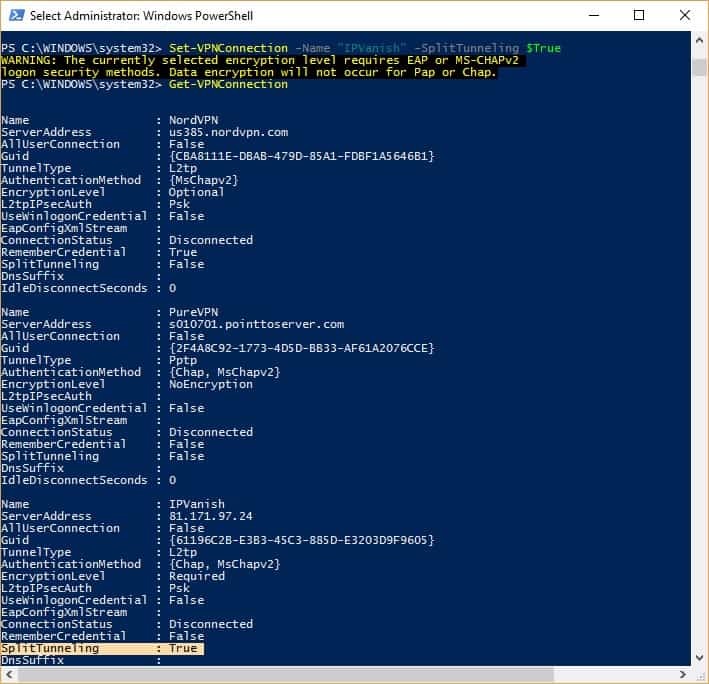 This example will use your local connection to access the internet while the VPN will be used to access remote resources, such as a private business server that can only be accessed via VPN. The VPN will only be used when a host isn’t available on the local network. 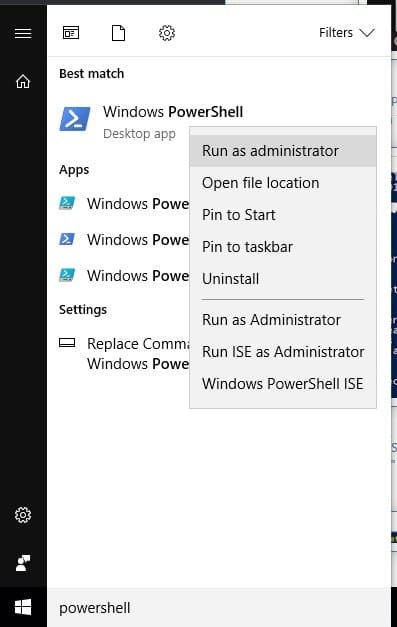 In this tutorial, will use Windows 10. We’ll assume you’ve already set up your VPN connection, and you only need to enable split tunneling. You’ll need admin privileges and the destination subnet for your VPN private space. 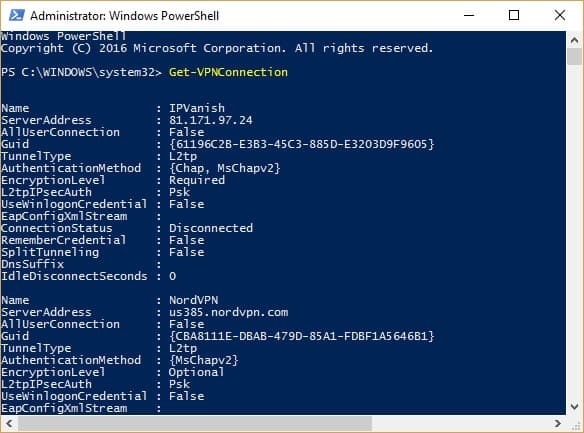 Type Get-VPNConnection and press Enter to bring up a list of all your available VPN connections. (I test a lot of VPNs so there are several in my screenshot, but you’ll likely only have one.) Make a note of the Name of the VPN you want to split tunnel. You can check that split tunneling is enabled by entering the Get-VPNConnection command again. The split tunneling field should now be set to True. netsh interface ipv4 add route >DESTINATION SUBNET< ">INTERFACE NAME<"
See also: The best VPN for Windows 10 users. Setting up OpenVPN and split tunneling on DD-WRT routers is tedious and tricky business, so if you want to go the router route then we recommend purchasing a subscription to ExpressVPN. With that, you can install the ExpressVPN custom router firmware, or buy a router with the firmware pre-installed. It’s far easier than setting up everything manually. 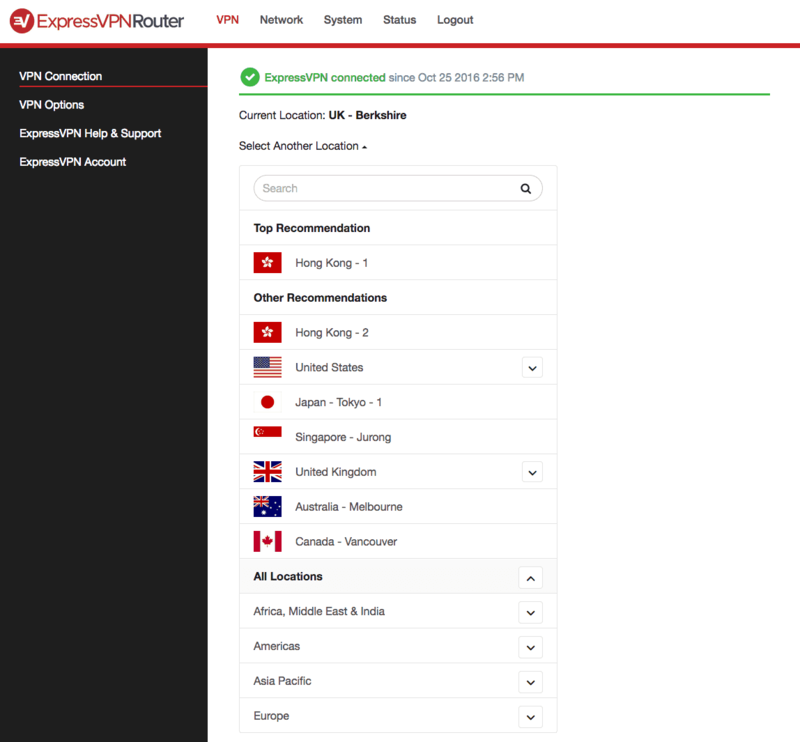 BEST VPN to split tunnel on DD-WRT routers:ExpressVPN is our to choice. This VPN leads the way with its easy to use no-fuss apps and router software. It has a vast server network that is optimized for high-speed connections. Hard to beat on privacy and security. Works with all major streaming services. There is a 30-day no-quibbles money-back guarantee so you can try it risk-free. In the DD-WRT dashboard, go to Service > VPN. Find the Policy based routing box and enter IP addresses for each of the devices you want to go through the VPN. Simple as that! If you’re not sure of the IP addresses of your devices, you can find them by going to the Router status page of the DD-WRT dashboard. Under the Network section, find Active IP Connections. Click the number next to that to launch the Active IP Connections Table. Here you can view the IP addresses for all incoming and outgoing connection on the router, as well as protocols and port numbers. If you want to specify which programs or apps use the VPN, one way to do this is by split tunneling by port. Each application likely uses a different port, for example web browsers use TCP ports 80 and 443, Spotify uses TCP port 4070, and Steam uses UDP ports 27000 thru 27030. So by specifying which specific ports to route VPN traffic through, we can split tunnel by application. Unfortunately, this is more difficult than it sounds on DD-WRT. You’ll need to familiarize yourself with IPTables, which governs Linux firewall rules in the firmware. You might find this tutorial useful as an example. Go to Administration > Commands. Under Firewall click Edit and enter the necessary commands. Then go to your OpenVPN client configuration in DD-WRT and find the Additional config box to modify your OpenVPN config. If you want to tunnel traffic by its destination, i.e. by website or some other sort of server, then IP routing might do the trick. Replace the Xs with the same address you entered under Server IP field of your OpenVPN configuration. Replace the Ys with the IP address of the server you want to route VPN traffic to, and the Zs with the appropriate subnet (the latter will often be 255.255.255.0). Note that if you want to route all VPN traffic going to a specific website, then you’ll need to add the IP addresses and subnets for all of the servers that website uses. Netflix, for instance, uses several dozen IPs and they can change at any time, so you will need to find an up-to-date list of Netflix IPs and update this configuration regularly. Tomato doesn’t have policy-based routing baked in like DD-WRT, so you’re pretty much stuck with using IPTables to get the job done. On the Tomato dashboard, with your OpenVPN connection already set up and working, this is an example of how to enable selective routing. This results in 192.168.1.11 and 192.168.1.211 to access Internet through VPN, which is exactly what was desired. The problem I am having right now, though, is that every other IP from my network can not navigate Internet, as they do not have a routing rule. Is it possible to solve it easily, with a few lines of code ?